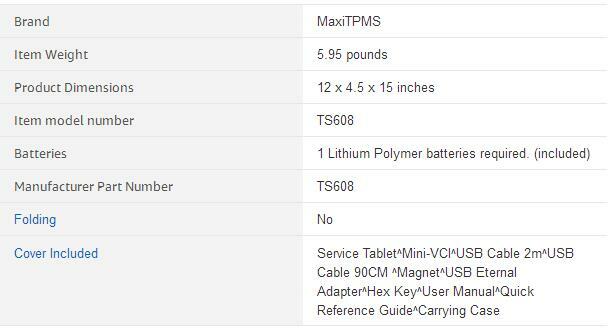 The Autel MaxiTPMS TS608 is diagnostics, service and TPMS tablet with mini Bluetooth Vehicle Communications Interface (VCI) for wireless connectivity. The tool features an embedded antenna for TPMS sensor activation and MX-Sensor programming to replace damaged sensors Compatible with vehicles 1996 and newer, the TS608 can diagnose all system modules, offers an array of system services including ABS, SRS, EPB and OLS maintenance tasks and is a complete TPMS service tool with OBD II relearn capability. The TS608 includes a one-year warranty and a year of free software updates. 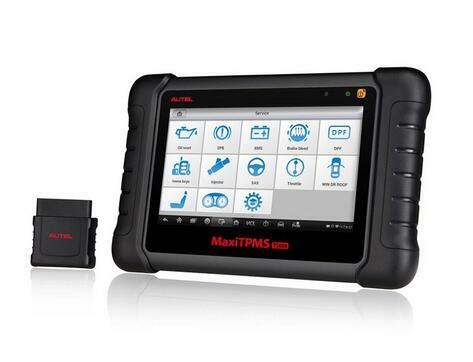 As the first comprehensive TPMS & Diagnostic tool in the market, Autel Scan Tool MaxiTPMS TS608 provides you with superior experience in TPMS health check, sensor programming, TPMS relearn, all system diagnostics as well as special service functions. Equipped with a 7-inch touch screen with 1024 * 600P resolution and a VCI mini for wireless communication with the test vehicle, powered by the quad-core Cortex-A9 processor for smooth operation and featured by advanced TPMS & Diagnostic technology, MaxiTPMS TS608 is setting new standards for TPMS service tools. ● Complete full service projects faster with TPMS and all systems diagnostics in one mobile tool.